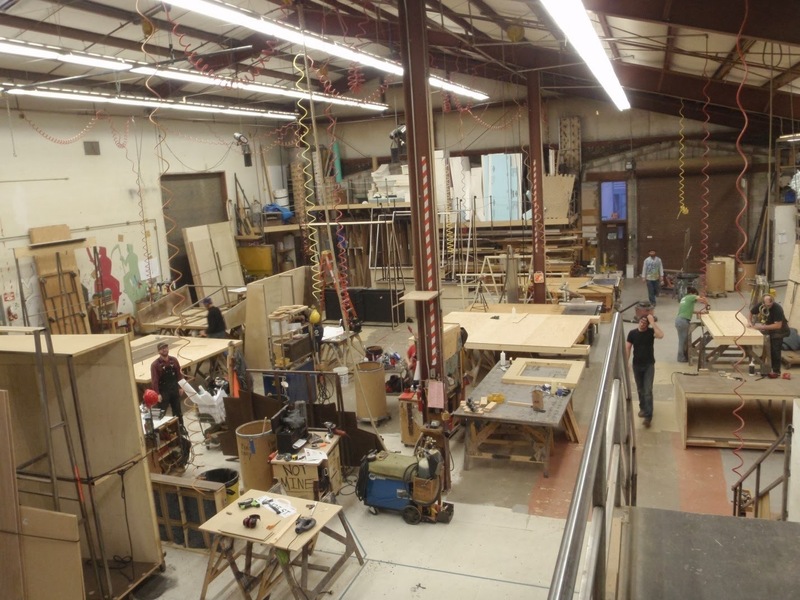 I have now been in Ashland for two weeks working in the scene shop for OSF. I continue to work on a few notes as they arise for the shows. One of the greatest challenges of operating in a repertory schedule is to find the time and opportunity to do set notes. Many of those notes need to be done while the scenery is in its proper place on stage. However, in a rep schedule, you might have a few precious hours to accomplish some notes in the morning before a rehearsal begins, then there is another rehearsal that often doesn’t end until 11:00 pm or later, and then the set is shifted offstage and another one is shifted on. I was tasked with constructing some rolling platform wagons for the show Water by the Spoonful. 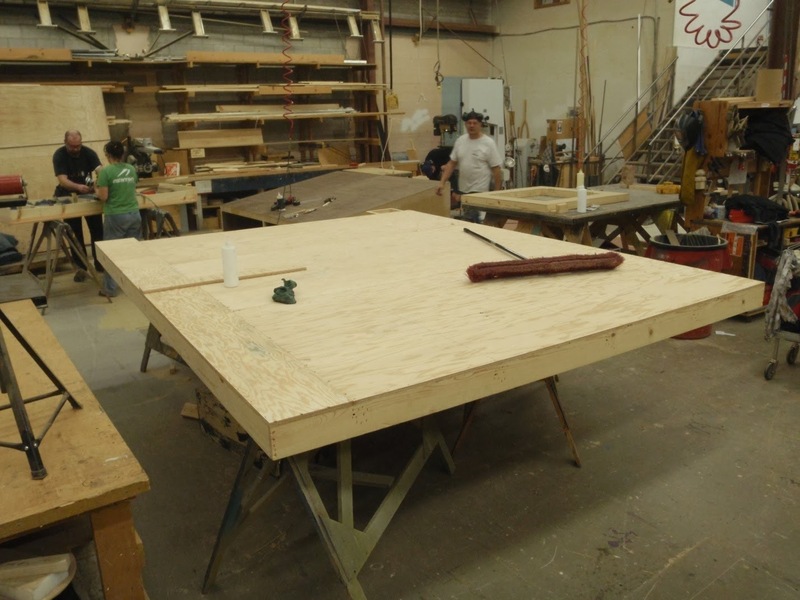 These are simple platforms constructed from 2x4 and plywood. Some of these wagons will carry a raked platform, some a projection screen, some both. 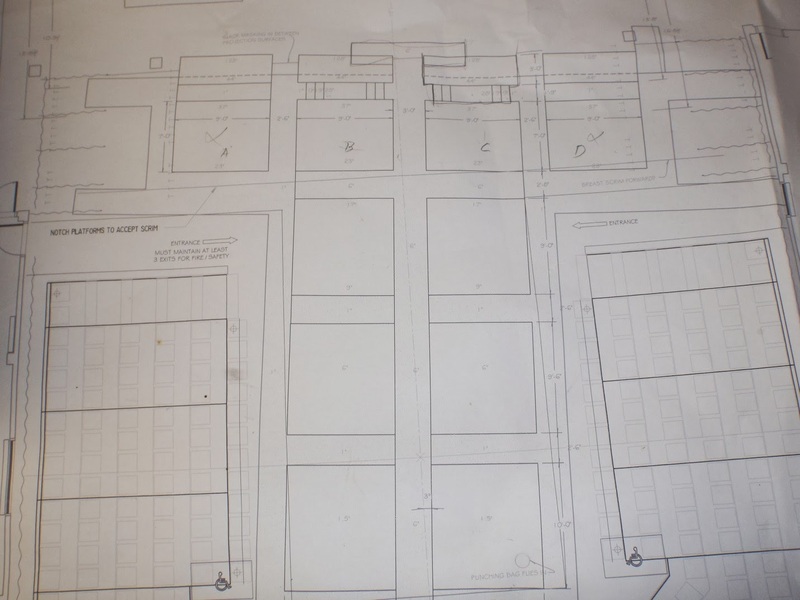 There are 10 large rectangles, some of which are raked platforms; some are shorter platforms that aren’t raked. There will be an LED lighting effect in the platforms. Nearly 600 holes, about 1” in diameter, will be covered by small plexiglass discs with an LED underneath to create different light configurations on the floor. You can see how tight the working space is, and how quickly it can get cramped. 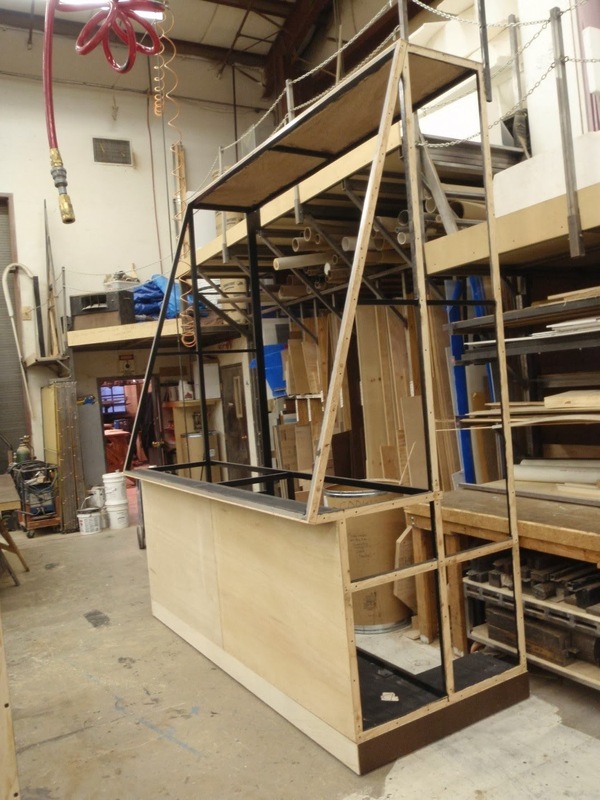 I think that everyone is very excited to move to OSF's new scene shop, where they will be able to set up the full set for a show before it goes into the theatre. Being able to ensure that every piece of a set fits together and works properly, with all the tools and benefits of the shop at hand, before installing it into the theatre is a great advantage. Some people are concerned about not being so close to the theatre complex. The current scene shop is a block away from the theatre, the new shop is about five miles away.. Being able to walk to the shop and get the tool or material that you need to accomplish a note is very convenient. 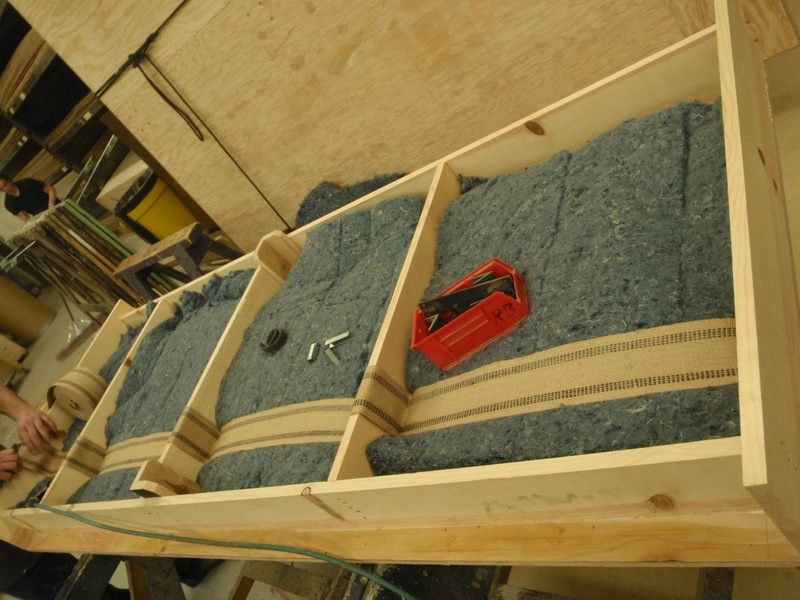 This is a picture of a bed frame, that was printed ON A 3D PRINTER!! So awesome!!! I believe it is for Richard III. 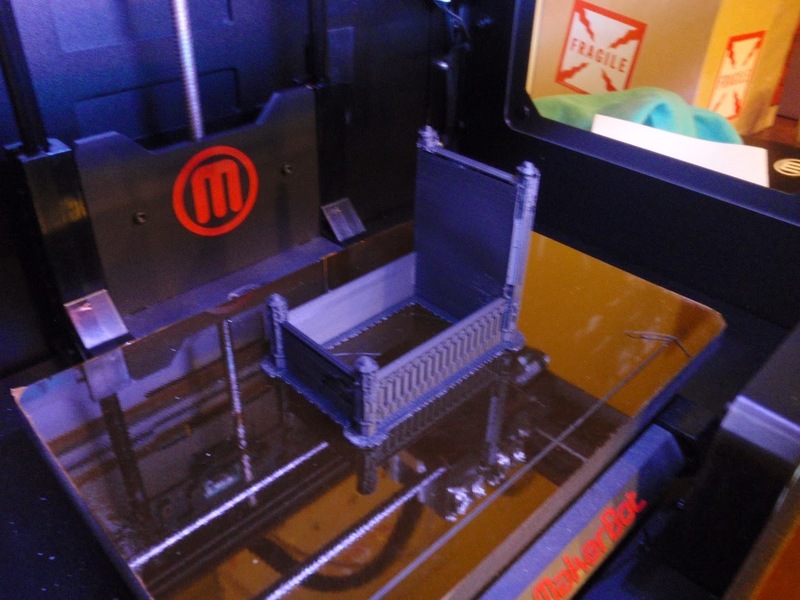 This awesome piece of technology is being used by OSF to create model pieces. A scenic designer (or maybe assistant designer, or assistant technical director) creates a 3D drawing, and then prints it. The designer can then paint it accordingly. The shop also printed some line weights for The Tempest. They needed to resemble light bulbs that were already part of that scene, so they printed hollow light bulbs and filled them with ball bearings. I am also told that there is an attachment for the printer, called the “digitizer.” This scans an object, and will then either reprint it or create a drawing of it for manipulation. The Elizabethan and Bowmer Theatres back up to Lithia Park. This is a beautiful and lovely park. As I was walking through the park on Saturday, I thought it would be a great place to have picnic dinner before the show. This idea was inspired by the long standing tradition of “tailgating” at the Santa Fe Opera. This tradition started years ago, and has since taken many shapes. Some people arrive and find a picnic table or set up their camp chairs and have a sandwich, cheese and crackers, and a bottle of wine. Others arrive to a fully catered three course meal with silk table cloths and fine china. The opera decided to try and take advantage of this, and teamed up with their catering company to offer “box meals” for an additional price to the ticket for the show. When they arrive, patronspick up their dinner and enjoy it in the wonderful outdoors overlooking the Sangre de Cristo mountain range. I wondered if OSF could do the same thing, team up with a local catering company over the summer and encourage their patrons to enjoy a picnic in the park, maybe even provide a blanket that they could borrow and then return in a hamper before the show. This coming week I think that I may be observing or taking part in a scenic changeover. In my next few weeks I hope get a closer look out the automation systems.